The creative gals of two chatty chicks had an adorable idea for fall. 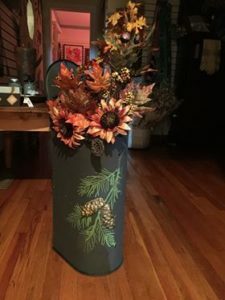 They first painted a mailbox deep green then used our Raised Plaster Pine Branch and Mold Stencil Set to create the pine branches you see on the top of the mailbox. The pine cone mold comes with the stencil set and is used with plaster of paris or Durhams Water Putty to create dimensional pine cones. They began by plastering the pine branch over the top area of the mailbox. You can save yourself tons of time by pre-tinting the joint compound with dark green paint. The compound will dry lighter, producing light green pine needles. Once the pine cones were dry, they painted them light brown and glued them over the raised pine branches on the mailbox. 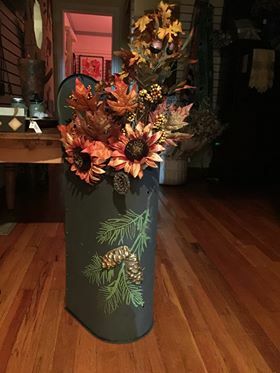 To finish this cute project, they turned the mailbox on it’s end and filled the opening with fall colored silk flowers and leaves. Wouldn’t this be adorable as a table arrangement or on your front porch next to the door?